Ok, so during my last post I (rather extensively) commented on procrastinating my writing responsibilities, particularly editing my novel called "The Rescue of Dr. Zale." Looking back, I think the main reason is that the novel, written when I was in high school (not THAT long ago), needed extensive revision toward the end. In brief, I decided to have a character live who originally died, and I thought the main climax was too juvenile and had to be completely cut and redone. One of my main goals was to cut cut cut it down. Compress the writing. I had edited it before, a while ago. I forget how old I was--maybe nineteen, and I'm 23 now--and it ended up 1,000 words longer. A round of query letters to agents came back fruitless. I put it in a bin and wrote another novel. Then W1S1 2012 happened. My prime objective in dropping back to W1S1 monthly was to have the time to edit longer pieces. So I got to work right away, and then lost steam when I reached the final chapters, and completion seemed daunting. I crawled forward, word by word, line by line, and this past weekend I finally finished it. In the end, the only way to do it was line by line. In all, I cut out 9,000 words. The draft in the picture is 25 pages longer than the electronic final copy. I have a lot more confidence in this version, so we'll see what the agents have to say. The coolest part about this project was realizing how far I've come since I wrote the first draft and edited it. Back then, I always put in far more than I took out; completing these edits with the goal of cutting really helped get my mind right, and the result is much more impressive. Glad it's done! But as always, there's more work to be done. As always, on to the next project. Just Read: SNUFF by Chuck Palahnuik--Totally awesome in the way that all his stuff is. Whenever I read his work, I want to write like him. There are so many things to do besides write. Right now I'm playing Hearts on my computer, listening to music, and I just put on gym clothes in preparation for a run, which I may or may not take depending on whether the creative juices get flowing here, or if I feel like I need another way to procrastinate. I'm losing this Hearts game terribly, if you were wondering. It's also a rainy Sunday, which doesn't bode well for productivity in the first place. I've watched about an hour's worth of behind-the-scenes clips of Spartacus (one of my favorite shows of all time). I've got this story idea in mind . . . . Check this picture out. 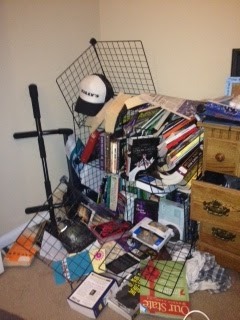 That's my wire bookcase, collapsed. Maybe I have too many books? It took me too long to figure out how to upload that pic, so I went ahead and lost that game of Hearts. Just got a can of cherry coke zero out of the fridge. I figured some caffeine could help. Maybe I'm just sluggish from that gigantic Chipotle burrito I had for lunch. Happy Cinco de Mayo! Speaking of gigantic Chipotle burritos, I may have to run off here in a minute before finishing this blog post and procrastinate my writing in the bathroom. You're welcome. Total word count today: 0. But, I have successfully reviewed the requirements for story submission to Allegory Magazine! Woohoo! Props to me! Hoping to see Ironman 3 later tonight after making some chili. Think I can fit in a nap later?